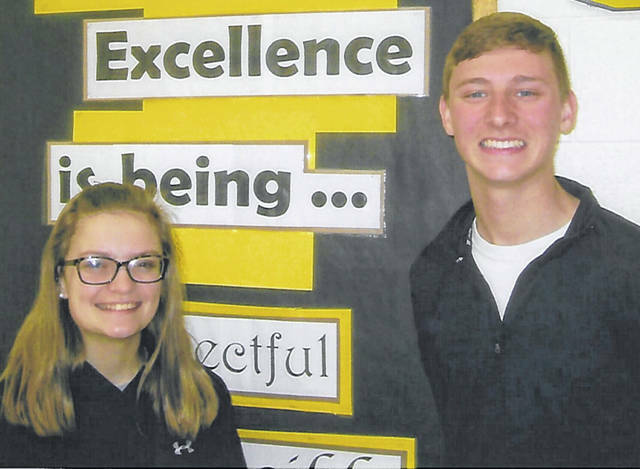 NORTH ROBINSON — Two Colonel Crawford High School seniors were recently awarded the Lions Club Student of the Month award. The students and their parents were all guests of the C.C. Lions Club at their March dinner meeting. Each award winner was presented with a commemorative certificate and a check for fifty dollars. Braxton James was selected as the February Student of the Month. He is the son of Marvin and Kara James. Braxton is a member of Young Life and FFA. He has been a 4-H member and currently also serves on the Junior Fair Board. As a cross country participant, Braxton attended the 2018 State Meet. He also attended the State Track Meet, participating in the 4 X 800-meter relay and the 800-meter run. James attends St. John’s United Church of Christ in Bucyrus. His future plans include attending The Ohio State University ATI and majoring in crop management and soil conservation. Selected as the March Student of the Month is Bailey Niedermier, daughter of Andy and Jennifer Niedermier. She serves as Class Treasurer and is a member of Project BLACK, Young Life, and the National Honor Society. Bailey has earned an Academic Letter each year. As a member of marching band, Bailey has been its president for two years. She is also a member of Pep Band, Concert Band, Senior Choir and Show Choir. She received the 2018 H. J. Gary Leadership Award for marching band. Miss Niedermier has been active in the CCHS Theater for the past three years. Bailey’s community service participation has been through the National Honor Society. She also is a member of UKE3, a Christian musical group that plays at local nursing homes and churches. She attends Bucyrus Nazarene Church and is on the Youth Council, in the Youth Band, and service Praise Team. He plans to attend Mount Vernon Nazarene University and major in music education.